Application Deadlines – Normally, November is the month when many colleges will allow early admissions. What is important for high school seniors to know is that the application deadline dates for each school will vary. Now is the time to review the dates for each of the colleges you are interested in attending. There is a difference between the date received and the post marked date. Be mindful about getting your admission applications submitted before the deadline dates. – Are there colleges on your list that require you to submit SAT or ACT scores? If so, be sure to enroll to take those exams as soon as possible. – Be sure to give yourself, as well as those who you intend to ask, ample time for recommendation letters. – Some schools may require you to write an essay about yourself or your interests. Be sure to provide your assigned HIFE Coach adequate time to review your essays for content and grammatical errors. – How will you pay for your college education? It is critical to discuss with your parents the cost to attend the schools you have selected in order to develop a plan for this big expense. Find out the estimated tuition, room and board, books and fees for each school. Outline these costs side by side to easily compare which school is most affordable. Many parents assume that Community College or Junior College is only for those who can’t get into a “real school”. This is undoubtedly one of the most costly mistakes a parent can make. Statistics show that students who start in a Community College do better than the traditional students once they transfer to a traditional school. Attending a Community College is a great way to potentially save thousands of dollars. In addition, a student can attend a Community College while still in high school; and, in most cases, the high school will pay for the class as it also counts towards high school credits. Next, some students actually graduate from Community College with an associate degree before they graduate high school. These are just a couple of advantages and opportunities that Community Colleges have to offer that most parents and students don’t overlook. 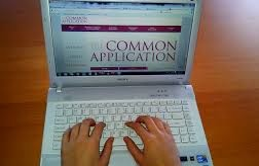 The Common Application is an undergraduate college admission application that applicants may use to apply to any of 517 member colleges and universities. It provides a holistic admissions approach to reduce the redundancy and workload for students in the college admissions process. You’re ready to get started with your Common App, but there’s one small problem: you don’t know how to get started. Don’t worry. Your HIFE Coach is here to help. You can start the process today or when you are ready, later this fall. Create an account — Your username will be your email address, so make sure you use one that you check … on a regular basis. You’ll also be asked to set up a password. Write it down in a place where you will be able to find it when you need it. Add some colleges to your list— After you log in, click on the College Search tab to add schools to your My Colleges list. If you have specific schools in mind, you can search by name. You can also search for schools based on additional criteria such as location, deadline, or distance from your home. Know what each college will require of you — The information you share through the Common App will tell colleges a lot about you, but colleges will also have additional questions that are unique to them. You can get to each school’s “Questions” from your Dashboard, where you’ll find them listed under Application and Writing Supplement. (Not all schools will have a separate Writing Supplement.) You can also search for deadlines, teacher evaluation requirements, and other information on the searchable, sortable Requirements Grid. and some details about your parents such as their educational background, occupations, and employers. Talk to your counselor and parents (and maybe a college admission officer) before you sign the FERPA Release Authorization. You have the right to access your letters of recommendation after you enroll in college, assuming the college saves those forms. In the “Recommenders and FERPA” section of the application, you’ll be asked if you wish to waive that right. You’re free to respond as you choose, but you need to know that the choice you make could have significant implications regarding how colleges view your application. Once you complete the FERPA Release Authorization, you can’t change your answers, so make sure you talk to someone — a counselor or parent – who can help you understand your choice before you make it. Check your application for accuracy before submitting— When it comes time to submit your applications–and for many of you that will be merely months away–make sure everything on it looks correct. Yes, that means proofreading, but it also means checking that your responses appear exactly as they should. If something looks amiss, our HIFE Coach can help you fix the problem before you send the application. In the 2014-15 Common App, member colleges and universities can ask for writing samples on either the Member Questions page or the Writing Supplement. This is a change from last year’s Common App. Some applicants and counselors are finding it tricky to identify all of the writing samples that a college might require, especially those that are triggered based on responses to other questions. The First- Year Writing Requirements Overview posted within the Applicant Help Center will help you identify whether a college requires writing of any kind. It lists all of the colleges and universities that have short answer and/or essay questions as part of their First -Year application and where those questions appear. In general, there are three kinds of questions that you may encounter: required, conditional, and optional. Required questions are….well…required. This means you must provide a response to the question prior to the submission of the application.